The French Enlightenment is often labeled as the period where the novel developed as a distinct genre. The wide and heterogeneous array of texts and images housed in the W.T. Bandy Center's Morris Wachs Collection, Vanderbilt University’s Special Collections, and the Vanderbilt University Art Gallery, invites an exploration of the question of the myriad ways in which these works might be understood as literature, and the unexpected forms of literacy or being literary that come from the experience of reading them. Each sub-theme in the exhibition, from a focus on the material production and decoration of books to investigations of how the contents of these books touched readers in both body and mind, reveals the deep connections between the physical form of the work and the culture in which it existed—and that it also helped to create and reform. The Enlightenment literary text was both a representation of, and a tool for, personal, aesthetic, social, and even political change. 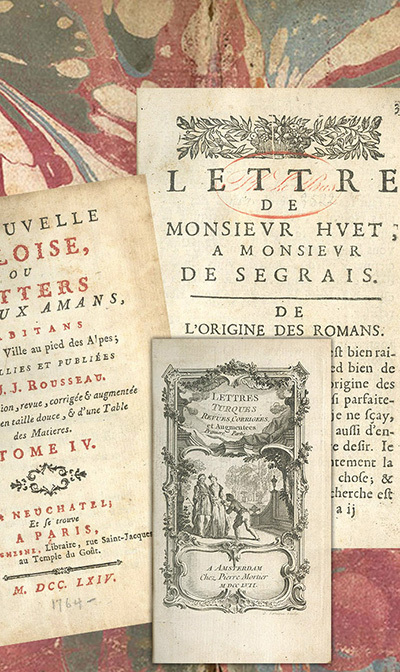 While the processes of the movable type of a printing press were well exhibited in the Encyclopédie, book-making, printing, and reading were intimate, hands-on processes in the 18th century. Reading was not only about being educated, but about “knowing dangerously.” Books both warn of immorality and tempt their readers to explore the provocative discourses within. They play with forms of language that touch readers’ sensibilities, thus provoking unexpected ways of judging societal education. Representations of feminine beauty and far-off lands fascinated 18th century readers because of their unfamiliarity. Weaving together stories and images of women and foreigners creates a unique reading experience in which the female form becomes exotic and the foreign body is eroticized – a juxtaposition that tantalizes the reader. In 18th century France, a book could be much more than merely words on pages. Books often included tiny, intricate motifs, pull-out maps and diagrams, and miniature prints. They depicted everything from common life, elaborate architecture, or more fanciful visions of fantastic or heavenly worlds. Choices ranged from simple leaves of paper bound into a coverless booklet to gold-embossed leather covers lined with marbled pages. What did it mean to interact with a book in the 18th century? Materialist texts show how information moves from print and image to idea and imagination. How can we re-imagine the personal and philosophical relationship between the reader’s body and the ‘body’ of the text?